Homemade Creamed Corn is an easy and comforting side dish recipe made with sweet and delicious corn kernels mixed in a creamy sauce made from milk, butter, and cream cheese. Learn how to cook this mouthwatering six-ingredient creamed corn recipe on the stove or directly in your slow cooker and enjoy with friends and family this holiday season! Everyone, old and young, loves corn. And my family, with its deeply planted corn farming roots, is no exception. 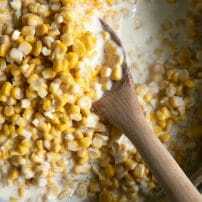 Served straight from the cob, in a corn chowder, corn fritters, or in these Mexican street corn nachos, corn tastes delicious in all kinds of recipes from sweet to savory, hot to cold. 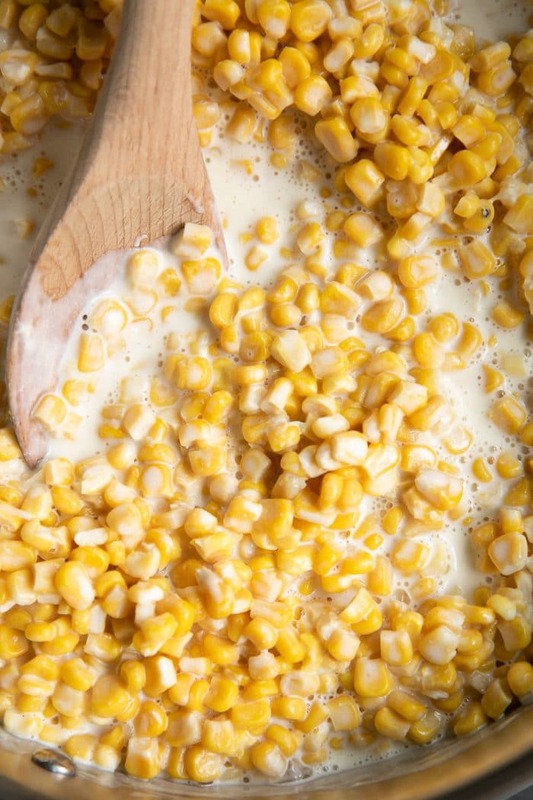 Versatile and readily available, you’ll find corn fresh on the cob, frozen, or canned. 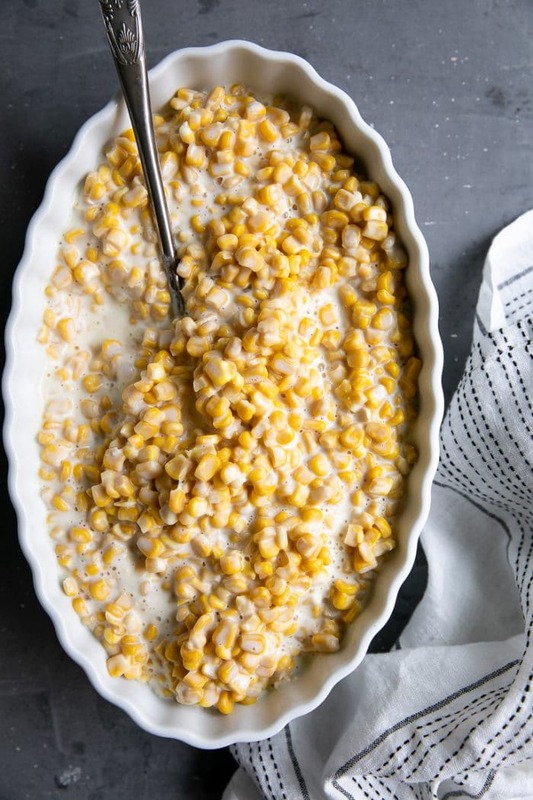 With just a handful of other simple ingredients, you can make this creamed corn recipe using any of the above in your very own home. In this recipe, I used canned corn kernels as I find that the kernels hold their shape and texture the best when compared to frozen corn and it is far less work than using raw corn from the cob. The result was creamy, delicious, and by far the best homemade creamed corn I have ever tasted! Creamed corn comes in several varieties. In this version (the best version) of Creamed Corn, I mixed together whole corn kernels with a homemade cream sauce. I was hoping to achieve a creamed corn similar to the cream corn served at Lawry’s Prime Rib Steakhouse (a family tradition/obsession). The result was hugely successful in taste- although I have no idea if the recipe itself is actually anywhere near that used at Lawry’s. Creamed corn, however, most definitely did not originate at this delicious steak restaurant. 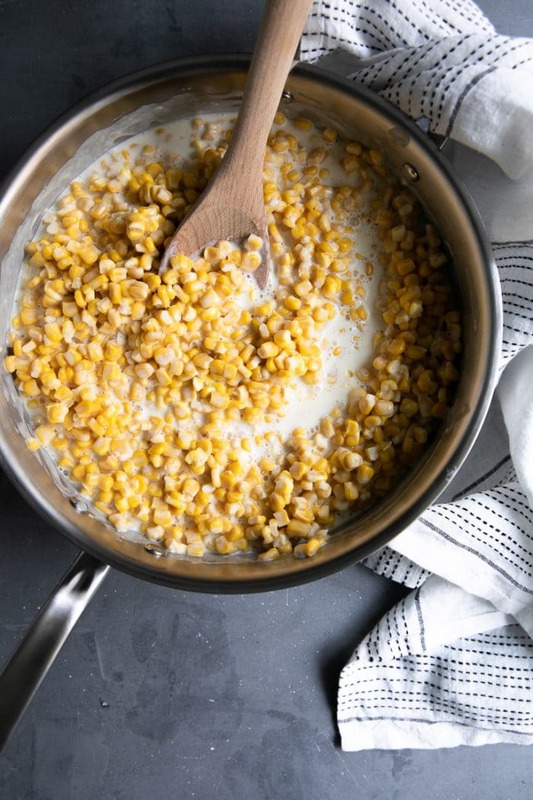 Originating in Native American cuisine, creamed corn is also made (in a much different version) by pulping corn kernels and collecting the milky residue leftover by the corn. In many versions of creamed corn, a variety of sweet corn will typically be used for its sweeter taste. In addition, several methods of creamed corn preparation suggest pureeing a portion of the corn to release the liquid contents of the sweet corn kernels. In these versions, sugar and starch may be added, or in other homemade versions milk, cream, or cream cheese may be added. 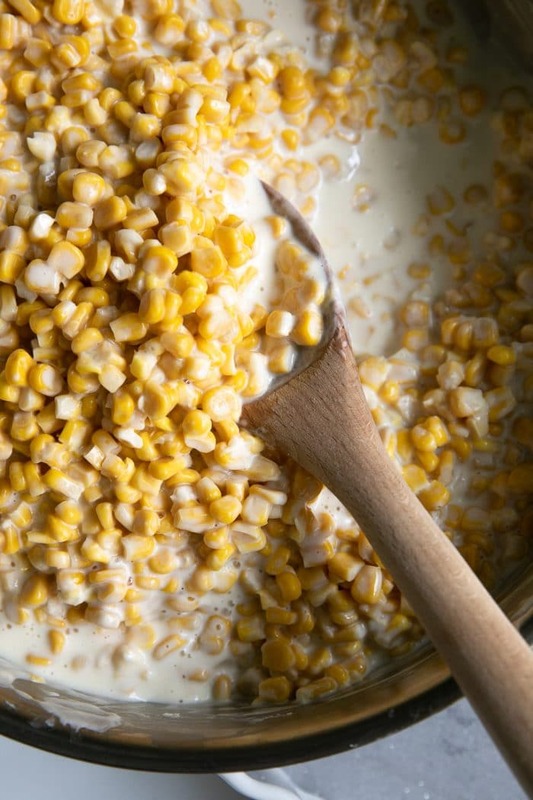 Store-bought creamed corn is often made without the addition of milk or cream. What makes this the best Creamed Corn Recipe? It’s so easy! It’s almost as if it’s begging you to make it for all the holidays and seasons. Prepare homemade creamed corn on the stove in 20 minutes, or save the space and toss all the ingredients in your slow cooker for a few hours. That’s all it takes! Heat large, wide, heavy-bottomed pot over medium heat. Add the butter, cream cheese, and milk. Slowly warm, stirring constantly, until the butter has melted, cream cheese has softened, and the milk has warmed. Not everything has to be completely dissolved, but make sure the cream cheese has softened. Stir in the half and half, sugar and salt, mixing well to combine and taking care not to boil the mixture. Add the corn. Stir well to combine. Reduce heat to low and continue to cook until the cream cheese is fully dissolved and corn is heated through approximately 15 minutes. Stir frequently. Season with additional salt or sugar, to taste. Serve garnished with fresh chopped chives or green onion, if desired. Add ALL ingredients to the bowl of a large slow cooker. Cover and cook for 2-3 hours on HIGH or 4-5 hours on LOW, stirring occasionally. Season with additional salt and sugar to taste and garnish with chives and green onion, if desired. Does creamed corn reheat well? Yes! This homemade creamed corn recipe reheats incredibly well using several different methods. 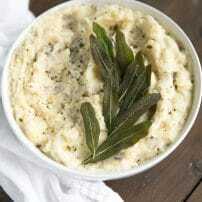 Use the microwave, stovetop, or even place it back in the slow cooker. Should you find that your creamed corn became thicker, simply add milk, small amounts at a time, until desired consistency is reached. Serve this creamed corn with Enjoy this homemade creamed corn within 3-4 days for best results. If you try making this Creamed Corn Recipe, please leave me a comment and let me know! I always love to read your thoughts and feedback! DON’T FORGET TO PIN AND SHARE THIS HOMEMADE CREAMED CORN RECIPE FOR AN EASY AND FLAVORFUL DINNER OR HOLIDAY SIDE DISH. Homemade Creamed Corn is an easy and comforting side dish recipe made with sweet and delicious corn kernels mixed in a creamy sauce made from milk, butter, and cream cheese. Open each can of corn kernels and drain completely. Set aside. Heat large, wide, heavy-bottomed pot over medium heat. Add the butter, cream cheese, and milk. Slowly warm, stirring constantly, until the butter has melted, cream cheese has softened, and the milk has warmed. Stir in the half and half, sugar and salt, mixing well to combine and taking care not to boil the mixture. Add the corn to the milk and cream cheese mixture. Stir well to combine. Reduce heat to low and continue to cook until the cream cheese is fully dissolved and corn is heated through approximately 15 minutes. Season with additional salt or sugar, to taste. Serve garnished with fresh chopped chives or green onion, if desired. Enjoy! Open each can of corn kernels and drain completely. Transfer to a large crockpot. Stir in the butter, cream cheese, milk, half and half, sugar, and salt, mixing well to combine. Cover your slow cooker and set to HIGH. Cook for 2-3 hours, stirring occasionally. Season with additional salt and sugar to taste and garnish with chives and green onion, if desired. Enjoy! 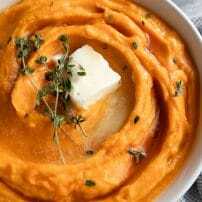 This recipe is intended to feed a large crowd. 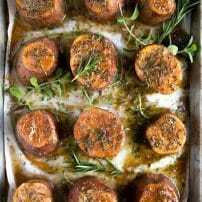 If you plan to prepare this recipe as a side dish for a family meal, I recommend cutting the recipe in half. For best results, use full-fat cream cheese, butter, and milk. Canned corn kernels NOT canned creamed corn.